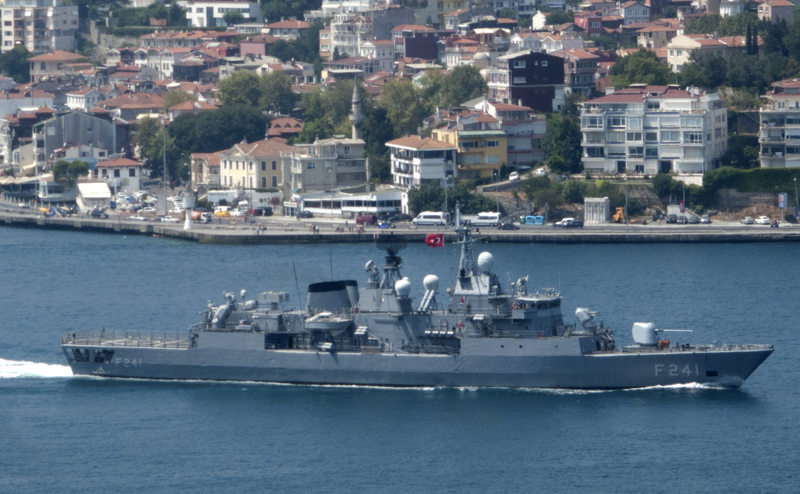 F-241 TCG Turgutreis passing through the Bosphorus to join the BLACKSEAFOR task force. Photo Kerim Bozkurt. Used with permission. 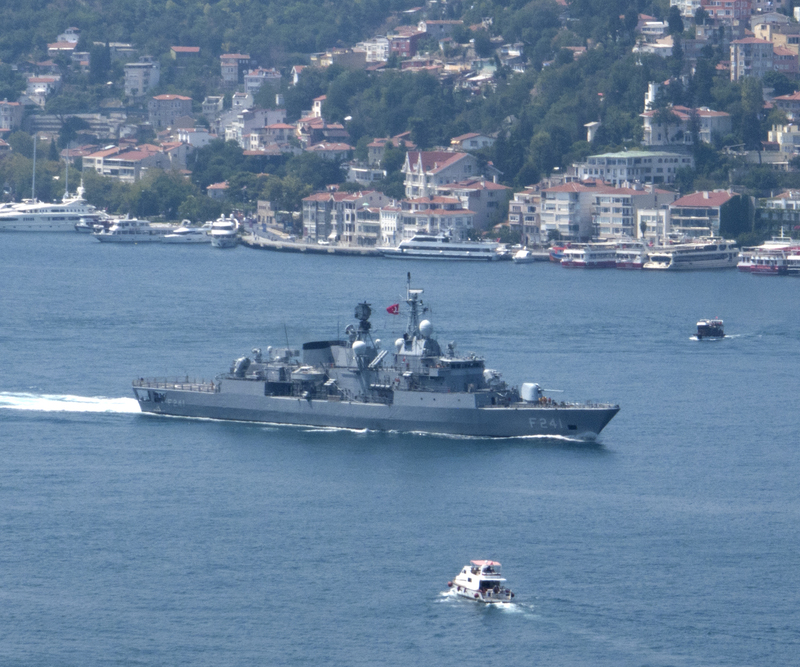 On 13 August 2013 Turkish frigate F-241 TCG Turgutreis passed through the Bosphorus and headed to Sevastopol in order to join the August activation of thee BlackSeaFor task force. Today, August 14, to the port of Sevastopol came for a visit and to early August 2013 Activation of the Black Sea Naval Cooperation (BLACKSEAFOR). Commanders moored at the pier bay chickens’ secundines tralshyka “surf” (Bulgarian Navy) missile hovercraft “Bora” (Russian Black Sea Fleet) corvette “Eustatiu Sebastian” (Navy League), frigate HRH “Turgutreis” (Turkish Navy) and ship management “Center” (Naval Forces of Ukraine) made ​​a courtesy visit to the newly appointed commander BLACKSEAFOR captain 1 rank Andrey Tarasov (Naval Forces of Ukraine). The ships began establishing connection communication system “computer-to-computer” FORESC, which will enable the exchange of information while performing tasks in the sea. Today at Staff Connection ships – ships of Commander Naval Forces of Ukraine “Center” held a press conference Command BLACKSEAFOR. Commander connection captain 1 rank Andrey Tarasov (Navy Ukraine) and commanders of ships made protocol visits to the Ukrainian Navy command and leadership Sevastopol City State Administration. Acting Commander of the Naval Forces of Ukraine, Vice Admiral Sergei Eliseev during a meeting with the command protocol connection has expressed satisfaction with the development of friendly relations within the framework BLACKSEAFOR and belief that during the current activation sailors will gain a new experience of interaction, will further strengthen the confidence and stability in the Black Sea region. Visiting ships in Sevastopol is pursuant to the Agreement on the Black Sea group of naval cooperation, the Committee’s decision commanders of naval forces in the Black Sea and in accordance with the list of activities of military cooperation of the Armed Forces of Ukraine in July-August 2013. Activation will continue until September 3. Help. BLACKSEAFOR is a naval (ship) connection “on call”, created according to the “Agreement on the establishment of the Black Sea Naval Cooperation”, signed on 2 April 2001 in Istanbul (Turkey). The main objectives are BLACKSEAFOR operations of search and rescue, humanitarian operations, anti-landmine threat operations for the protection of the environment, exchange of visits of goodwill and other tasks agreed by the participating countries. August 17, with the participation of delegations commander of naval forces in the Black Sea region’s change of command ceremony BLACKSEAFOR, on a rotating basis, it would be transferred from the Navy to the Republic of Naval Forces of Ukraine. In the second half of 15, 16 and 18 August the ship connections are open to visitors and residents of Sevastopol. On August 20 ships planned output connection to the sea, where they will be training on anti-submarine, air defense, down the aisle at minesweeper, in connection with search and rescue, swimming in the warrant, with tactical maneuvering and others. During activation, the ship will also visit with friendly visits ports of Novorossiysk (Russia) and Sinop (Turkey).